Sandys South Constituency #33 MP Jamahl Simmons has launched a new e-newsletter, which he is sending out to constituents via email as well as delivering hard copies to seniors by hand while canvassing. “When elected, I pledged to be open, accessible and accountable. This E-Newsletter along with constituency clinics, canvassing and constituency events, represents delivering on that pledge,” Mr. Simmons said. 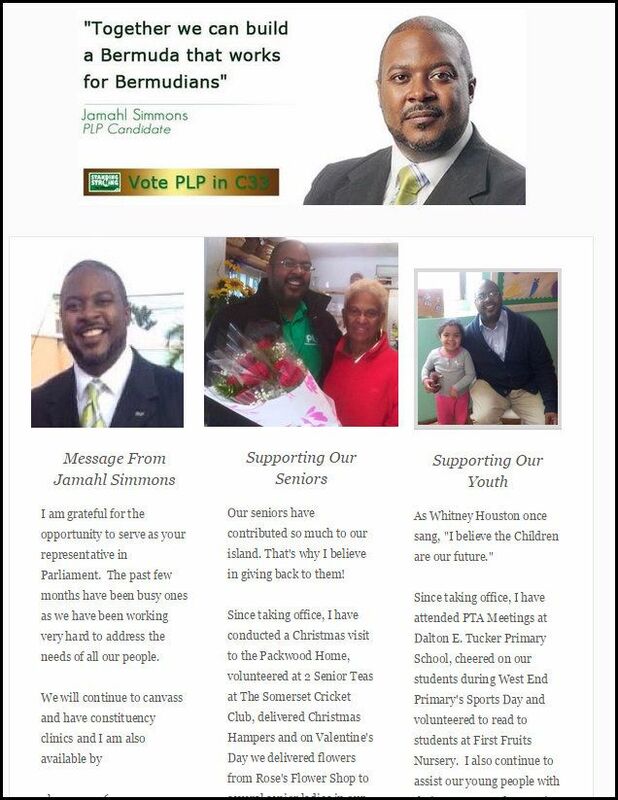 “Constituents who have not received their Sandys South Newsletter via email can contact me on jamahls@plp.bm and I will add you to the distribution list. Constituents who do not have email may contact me on 703-6070 to receive a copy. Oh shoot, is there no link to his Twitter account? I think this is a very sensible idea and congrats to JS for thinking of this. I’m sure he was getting tired of driving all the way from St G to Somerset every time some old dear at Packwood turned 100. Since JS has proven that the folks out there would vote for absolutely anyone as long as they were PLP, perhaps he can really test west end cluelessness by representing them from the east without ever actually having to go there in person. This email newsletter thing is a good start. Note to JS: Might be an idea to show up in person on re-election day. I hope he has a good editor.